Author(s): Michèle Wessa, Department of Clinical Psychology and Neuropsychology, Institute for Psychology, Johannes Gutenberg-University Mainz, Wallstraße 3, 55122 Mainz, Germany. Giannis Lois. In the last two decades, neuroimaging research has reached a much deeper understanding of the neurobiological underpinnings of major depression (MD) and has converged on functional alterations in limbic and prefrontal neural networks, which are mainly linked to altered emotional processing observed in MD patients. To date, a considerable number of studies have sought to investigate how these neural networks change with pharmacological antidepressant treatment. 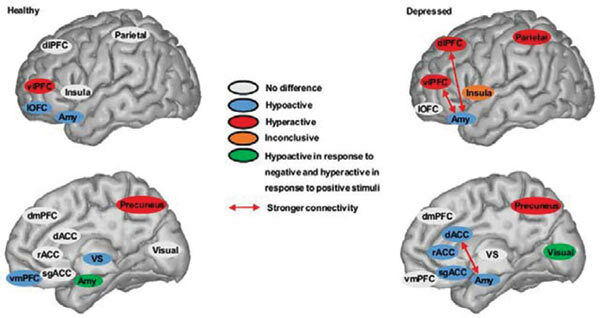 In the current review, we therefore discuss results from a) pharmacological functional magnetic resonance imaging (fMRI) studies investigating the effects of selective serotonin or noradrenalin reuptake inhibitors on neural activation patterns in relation to emotional processing in healthy individuals, b) treatment studies in patients with unipolar depression assessing changes in neural activation patterns before and after antidepressant pharmacotherapy, and c) predictive neural biomarkers of clinical response in depression. Comparing results from pharmacological fMRI studies in healthy individuals and treatment studies in depressed patients nicely showed parallel findings, mainly for a reduction of limbic activation in response to negative stimuli. A thorough investigation of the empirical findings highlights the importance of the specific paradigm employed in every study which may account for some of the discrepant findings reported in treatment studies in depressed patients. Keywords: Antidepressants, brain activity, major depression. Affiliation:Department of Clinical Psychology and Neuropsychology, Institute for Psychology, Johannes Gutenberg-University Mainz, Wallstraße 3, 55122 Mainz, Germany. Keywords:Antidepressants, brain activity, major depression. Abstract:In the last two decades, neuroimaging research has reached a much deeper understanding of the neurobiological underpinnings of major depression (MD) and has converged on functional alterations in limbic and prefrontal neural networks, which are mainly linked to altered emotional processing observed in MD patients. To date, a considerable number of studies have sought to investigate how these neural networks change with pharmacological antidepressant treatment. In the current review, we therefore discuss results from a) pharmacological functional magnetic resonance imaging (fMRI) studies investigating the effects of selective serotonin or noradrenalin reuptake inhibitors on neural activation patterns in relation to emotional processing in healthy individuals, b) treatment studies in patients with unipolar depression assessing changes in neural activation patterns before and after antidepressant pharmacotherapy, and c) predictive neural biomarkers of clinical response in depression. Comparing results from pharmacological fMRI studies in healthy individuals and treatment studies in depressed patients nicely showed parallel findings, mainly for a reduction of limbic activation in response to negative stimuli. A thorough investigation of the empirical findings highlights the importance of the specific paradigm employed in every study which may account for some of the discrepant findings reported in treatment studies in depressed patients.